The production of ThermoWood® products is realized in the production plant in the town of lisalmi in central Finland. This plant is governed by strict rules of quality system. The quality system for ThermoWood® production was created in cooperation with the Finnish Association of ThermoWood® Manufacturers (TWA) and sets the industry standard for this product. 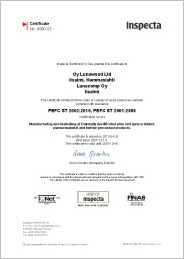 The company Oy Lunawood Ltd is a leading provider of high-quality products of ThermoWood®. 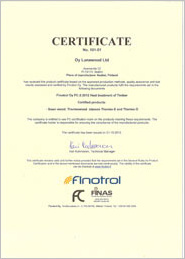 To meet the standard quality requirements for ThermoWood® (Thermo-S and Thermo-D) material it is being inspected by the Finnish national certification authority FINOTROL Oy. In the Finnish plant in Iisalmi the material for ThermoWood® production is provided from sustainable managed forests. 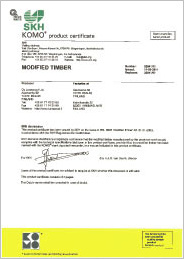 The chain of custody is certified by PEFC certificate (Programme for the Endorsement of Forest Certification Schemes) and has the right to use PEFC logo. This certificate provides assurance to customers that these products or product lines have origin in certified and controlled forests. For more information about PEFC certification please visit www.pefc.org. The Oy Lunawood Ltd. company in Iisalmi was awarded KOMO certificate for the ThermoWood® product by the Dutch company SKH. It confirmes the requirements for biological durability and quality of production. 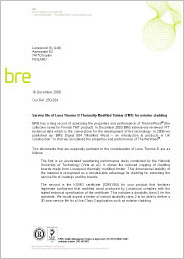 The company Oy Lunawood Ltd. in Iisalmi was awarded by the British certificate BRE for product ThermoWood® attesting minimum service life of material for 30 years.